Every origin story needs to be retold and rewritten after a time. Does Emerald Dawn add anything meaningful to the Green Lantern mythos of 1959, or does it merit its own Emerald Twilight? Emerald Dawn is a story about a self-destructive man who drives drunk, paralyzes his best friend in an accident, evades the law, and finds himself able to control enough power to become one of the deadliest supervillains in the DC universe. Now, you might be waiting for me to redeem the story or the character here – “But wait! He has a heart of gold.” or something like that. And I apologize for that. I really do. Because I’ve got nothing. Emerald Dawn is the single worst thing to happen to a superhero’s characterization except for maybe All-Star Batman and Robin. What is it about this book? Pretty much everything I just said. The hero of the story is introduced to us as a silent, moping individual who refuses to face up to his actions and their consequences. We don’t know what caused Hal’s fall from grace, but we know that he has been dumped by Carol Ferris and fired from his position as a pilot for Ferris Air before being re-hired as a simulator tester for the sake of his dead father. From there, Hal proceeds to get completely wasted (along with his friends) and drive into a sign with his friends in the back seat. He wakes up, discovers what has happened, and adamantly states that it is the fault of the sign and not his own. Hal is still some mixture of concussed and hungover from this when he sneaks out of the hospital to avoid arrest and goes to work the next morning, before Abin Sur’s Green Lantern ring decides that this is the shining example of humanity who shall be chosen to be his successor as Green Lantern. Hal Jordan has received a lot of criticism over the years, both in the pages of his book and out of them. He is impulsive, doesn’t plan ahead, and doesn’t answer to authority well. He has been accused of being given a gift he doesn’t deserve, and of being a stain on Abin Sur’s otherwise impeccable record. In the past, I’ve always been able to see much of this as a positive. His impulsiveness is part of why he is one of the highest willed creatures in the universe – he is the human stereotype that we present in Science Fiction, taken up to 11. He has used his single-mindedness to always to the right thing regardless of whether or not it was the thing most likely to lead to his continued survival. And that last complaint was just Sinestro being Sinestro. Then I read Emerald Dawn, and I found myself agreeing with every complaint. Blue collar archetype or not, there is nothing heroic about a man who will drive drunk, injure someone close to him, and then shift the blame onto an inanimate object. That’s not the ability to overcome fear, and it certainly has nothing to do with the “honesty” that impulsive assholes are normally credited with and that writer Kevin Dooley talked about in the trade paperback’s introduction. That is a spineless, snivelling worm who has no business being handed trust in anything, never mind the lives of other human beings. The fact that Hal “proves” himself by being the only individual in the Green Lantern Corps with the foresight to try something new, and in the process pull Ion out of the Central Power Battery a decade before it would be named and over fifteen years before it would truly be identifiable as such. 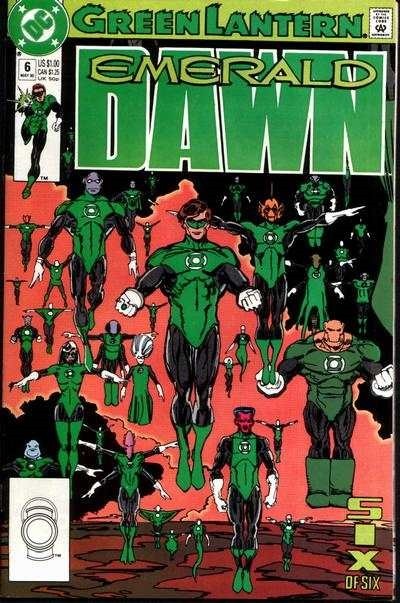 Taken in conjunction with the Emerald Twilight, and the idea of Hal losing it, becoming a supervillain and being possessed by a massive power living within the Central Power Battery seems to be inevitable and planned ahead, although we know that Twilight wasn’t planned until Green Lantern sales were found to be disappointing, while Dawn was created around the time Green Lantern Volume 3 was initially launched. Still, virtually everything about Hal in this story leaves a bad taste in my mouth, and it’s only the way in which he swears to change in some vague, undefined way thanks to his newfound responsibility that I can start to view him as some kind of worthwhile character and not just a stain who should have been left at the side of the road. The best thing Green Lantern: Secret Files and Origins did was to effectively erase Emerald Dawn from existence, while the best thing Emerald Dawn did was to just be vague enough that we could pretend most of the stories from the Silver Age happened in between. That’s not to say that there aren’t valuable story elements here, such as the hints of corruption within the Guardians and of Hal needing to work to earn a special future, but they’re muddled beneath a story where a drunk is selected to be the hero after standing out against his less likable colleagues, the apathetic and selfish Guardians, the villainous Legion and the often pointless Green Lantern Corps. When you need to tear down everything in order to give your long-standing hero something to stand out against, maybe the whole story needs to be rebuilt from the ground up.